Authors: Murphy, T. E.; Mondol, M. K.; Smith, H. I.
Abstract: We describe a method for characterizing field stitching in e-beam lithography systems. The method, which is based upon the moiré principle, enables one to measure interfield stitching errors to the nanometer level using only a conventional optical microscope. The technique is more sensitive than the commonly used vernier method, and it does not require the use of a coordinate-measuring tool. 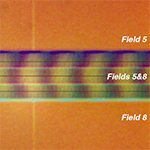 Our experiments show that this technique can determine the interfield stitching to within 2 nm.